Move to the Leeuwenhoek specimens site, the next article, or the previous report in this series. 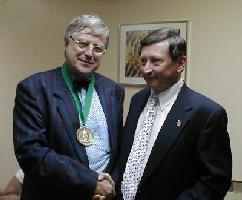 British microscopist and author Brian J Ford received the inaugural August Köhler medal at a ceremony in Chicago. 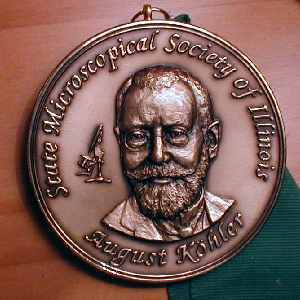 The medal, recognising distinguished contributions to international microscopy, has been founded by the State Microscopical Society of Illinois. The SMSI is one of the oldest microscopical societies in the world, and is only three years younger than the Quekett Microscopical Club, and the already 30 year younger than the Royal Microscopical Society. It was founded as the Chicago Microscopical Club in December 1868.Brian was actually awarded the medal in 1997, but only received the final version this June. Bill Mikuska, SMSI President, explains that the engraver of the medal sadly suffered a heart attack before the job was done, and recovered later in time to complete the task. The medal winner for 1999 was Don Thomson and the 2000 winner is Savile Bradbury of Pembroke College, Oxford.